The first solar power plant of 303 kW was put into operation in Trybusivka, Pischane district, Vinnytsia region, Andriy Hyzhko, head of the main economic department at the Vinnytsia Regional State Administration, told UKRINFORM. "In 2013, we expect a boom in the construction of solar power plants. Beside the Trybusivka, six more construction sites in four districts are nearing completion. 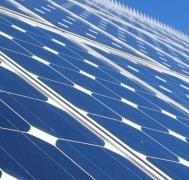 Now we have an order from a powerful Ukrainian energy company that wants to design an additional of 12 solar power plants. Overall, for 2013, the region will put into operation solar power plants for 200 MW," Hyzhko said. According to the official, the regional authorities see no threats or risks that could impede achievement of the planned volume of solar energy development in the region. At the cost of solar energy, it is planned to provide lighting for thousands of villages in the region and create about 200 new jobs. Now Vinnytsia region has four solar power plants with a total capacity of 1.2 MW. The estimated cost of building a solar power station with a capacity of 1 MW is 10 million UAH. The purchase cost of one kilowatt of electricity generated by solar power plants is 6.5 UAH. The "green tariff" will be in effect until January 1, 2017.